The first thing that comes to your mind, when you hear karela is "bitter", but trust me; this bitter vegetable is extremely beneficial for diabetes, as it helps to keep your sugar levels under control and your diabetes in check. 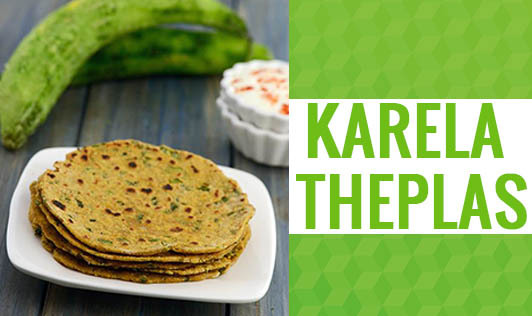 This extremely innovative recipe is made from the peels of the karela, which we usually tend to throw away. • Mix wheat flour, bajra flour, karela, garlic, turmeric, chili and coriander powder in a bowl. • Knead the mixture into a firm dough using enough water. • Divide the dough into 10 equal parts. • Make a small ball and roll out into a small roti. • Now cook the roti on a non-stick pan till both sides turn golden brown in color. • Brush the thepla's with a little oil. • Serve hot along with pudhina chutney or curd. • Wash the karelas thoroughly before you peel them. The skin can carry several microorganisms.